Sparkling at 4: Happy Birthday to The Prospector Theater! Happy 4th Birthday to The Prospector Theater in Ridgefield! Time flies when you're changing the way the world views employment for adults with disabilities. Since 2014, more than 200 Prospects have worked with pride and fortitude, 350,000+ hours of meaningful employment have been paid out in paychecks, and courageous, determined, talented adults have developed confidence in their vast abilities. Val Jensen, the founder, and visionary of the Prospector Theater has made a tremendous impact, not only here at home, but across the globe. 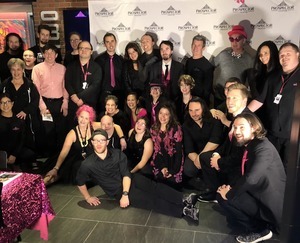 From NBC Nightly News to a visit from The Yankees during HOPE Week to The White House and recently unveiling 25 Prospect Street, the documentary, Jensen's sparkle is lighting up the world! Congratulations to Val, the Prospects, and all of the supporters near and far. We're so proud of what you've accomplished (and you've only just begun). The Prospector Theater needs your support! Please visit visit the Theater (25 Prospect Street, Ridgefield) and visit them online. Donate, buy gift cards, see a movie, enjoy some fancy popcorn, share stories and invest in SPARKLE. *Image courtesy Prospector Facebook Page.